NAV, Heated/Cooled Leather Seats, Premium Sound System, Satellite Radio, Onboard Communications System, iPod/MP3 Input, Back-Up Camera, TRANSMISSION: 10-SPEED AUTOMATIC W/SE... EQUIPMENT GROUP 201A, MINI SPARE WHEEL & TIRE AND MORE! Leather Seats, Heated Driver Seat, Cooled Driver Seat, Back-Up Camera, Turbocharged, Premium Sound System, Satellite Radio, iPod/MP3 Input, Onboard Communications System, Aluminum Wheels, Dual Zone A/C, Smart Device Integration, Heated Seats, Heated Leather Seats, Heated/Cooled Seats Rear Spoiler, MP3 Player, Keyless Entry, Steering Wheel Controls, Heated Mirrors. EQUIPMENT GROUP 201A Premium Plus Package, Voice-Activated Touch-Screen Navigation System, pinch-to-zoom capability, SiriusXM Traffic and Travel Link w/a, SiriusXM audio and data services each require a subscription sold separately, or as a package, by SiriusXM Radio Inc, If you decide to continue service after your trial, the subscription plan you choose will automatically renew thereafter and you will be charged according to your chosen payment method at then-current rates, Fees and taxes apply, To cancel you must call SiriusXM at 1-866-635-2349, See SiriusXM Customer Agreement for complete terms at www.siriusxm.com, All fees and programming subject to change, Sirius, XM and all related marks and logos are trademarks of Sirius XM Radio Inc, Heated Steering, TRANSMISSION: 10-SPEED AUTOMATIC W/SELECTSHIFT steering wheel paddle shifters, Remote Start System, Leather-Wrapped Shift Knob, MINI SPARE WHEEL & TIRE. 2018 Ford Mustang with Shadow Black exterior and Ebony w/Alcantara interior features a 4 Cylinder Engine with 310 HP at 5500 RPM*. 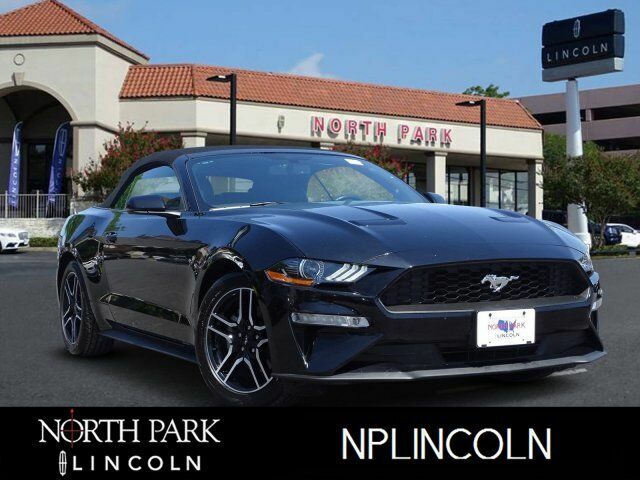 CARFAX 1-Owner KBB.com`s review says Now a sophisticated modern muscle car, the new Mustang delivers power, style and performance at a price almost anybody can afford..